Payment is due immediately upon the completion of any treatment or service rendered. 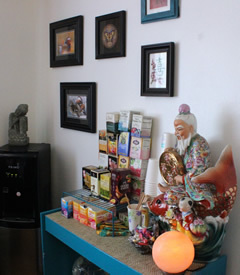 Nutritional counseling and individualized programs are included with acupuncture and herbal office visits. *Herbal consultations do not include the price of herbs prescribed. Your appointment time has been reserved just for you; please honor it. Failure to show up for your appointment prevents others from having the opportunity to receive needed treatment. If you cancel your appointment wiithout 24 hours notice, you will be charged the full amount, and if this appointment was part of a package, it will count as a session received.